Director General of the Food and Agriculture Organization (FAO) of the United Nations Jose Graziano Da Silva has expressed his admiration for Vietnam’s development achievements, especially in poverty reduction and food security. At a reception for Permanent Representative of Vietnam to FAO Ambassador Nguyen Thi Bich Hue in Rome on February 7, Da Silva spoke highly of the effective cooperation between the Vietnamese Government and the organization, considering this an example of collaboration that has significantly contributed to the implementation of the United Nations Sustainable Development Goals (SDGs). He also welcomed Vietnam’s participation in the Agreement on Port State Measures (PSMA) and agreed with Vietnam’s proposal for enhanced cooperation in this regard, covering technical support and high-tech application. For her part, Hue applauded FAO’s collaboration and support to Vietnam over the past years, saying Vietnam will contribute more to the organization’s activities in the time ahead, especially in the areas where the country has strengths and experiences like rice cultivation and aquaculture, as well as South-South cooperation. Despite the marked achievements in poverty reduction, Vietnam has still faced various challenges, especially in the context of adverse impacts of natural disasters and climate change, and complex commercial ties, she said. Given this, Vietnam hopes to receive more assistance from FAO in building green, smart agriculture that is competitive and adaptive to climate change, thus helping ensuring food security, developing the national economy and improving livelihood of local people, Hue added. 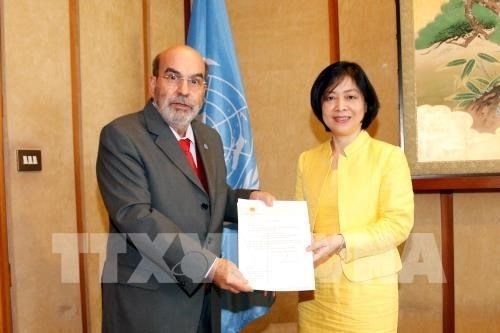 Hue also pledged to do her utmost to promote cooperation between FAO and Vietnam during her term of office. Established on October 16, 1945, FAO is a specialized agency of the United Nations that leads international efforts to defeat hunger. Its goal is to achieve food security for all and make sure that people have regular access to enough high-quality food to lead active, healthy lives. With over 194 member states, FAO works in over 130 countries worldwide. Since its inception in Vietnam in 1978, FAO has participated in hundreds of projects in the country, focusing on sustainable agricultural development, food security and nutrition, forestry and fishery. Vietnam has identified FAO as an important strategic partner in agriculture and rural development.